Our gorgeous face is always on display and as woman, we really don’t want facial hair. Having a peach fuzz is particularly hard to hide with makeup and is quite noticeable. It causes us to be extremely insecure and diminishes our overall confidence. As a woman, we’ve probably tried some combination of hair removal methods: shaving, waxing, threading, plucking and hair-removal creams. The fact is that with these traditional treatments, the hair grows back. Additionally, the skin on our face is hyper sensitive and all these traditional treatments cause irritation on top of the offending hair growing back! Noydeen Beauty is pleased to offer the state-of-the-art hair removal technology that effectively treats unwanted facial hair. Laser hair removal uses a laser light energy to gently remove unwanted hair and put an end to the hassles of constant shaving and waxing. During your hair removal process, the laser light passes over an area of skin to treat your hair follicles. With laser hair removal you can get the touchable skin you’ve always wanted. All you need is a few simple treatments to get lasting results. The secret lies in the technology that targets and destroys hair cells responsible for hair growth without harming the surrounding skin. This treatment is fast, easy and practically pain free. At Noydeen Beauty, we can help you get to the root of the problem with our state-of-the-art laser system. Laser hair removal gives you effective, permanent hair reduction anywhere on your face. Treatments are quick and easy letting you get back to your everyday activities. 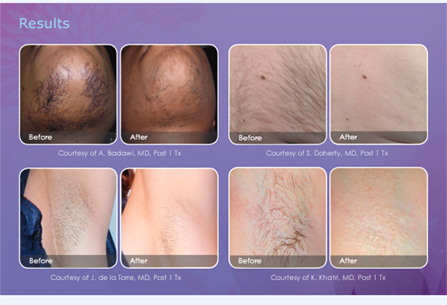 Discover how simple hair removal can be with Noydeen Beauty’s laser hair removal treatment. Say good-bye to peach fuzz and kiss your facial hair goodbye today! Cal Noydeen Beauty and schedule your consultation today. What areas laser hair removal treat? Our laser technology can remove hair from almost anywhere on the body including faces, backs, chests, arms, underarms, bikini, and legs.